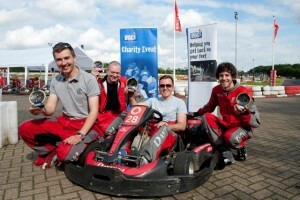 The latest BDCI fundraising event saw 22 teams from 11 meat industry companies compete in a go-karting ‘Endurance Challenge’ and the winning team, achieving an impressive 113 laps, was Cranswick. In second place was Interfood Slicing, completing 109 laps and coming a close third was Marel with 108 laps. BDCI festival chairman, James Sydenham, said: “This was a fantastic event with a really great atmosphere and positive camaraderie between the teams. Raising funds for the BDCI was of course the main objective of the day and we have successfully achieved that, but it was also an opportunity to have some fun and network across our industry. I would like to thank the organisers for ensuring the event ran smoothly, as well as everyone who came along to support us. Tickets for the dinner, priced at £140, are on sale now. Call 01727 896094, email info@bdci.uk.com, or visit the website www.bdci.org.uk and complete the on-line form.